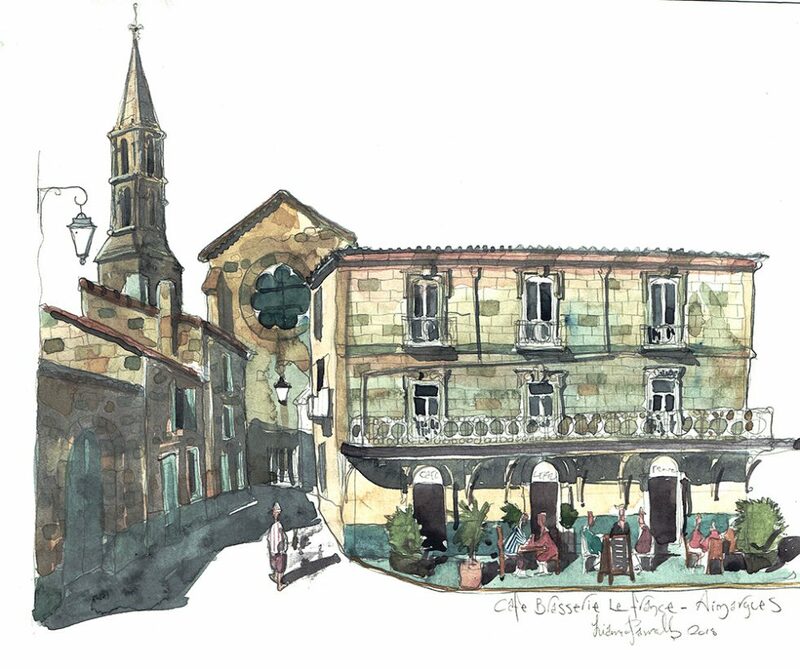 Earlier this year, we took a trip with friends down to Languedoc-Roussillon and Provence in France. I have not been to this part of France for many years and was really looking forward to it. Naturally, I took my paints, and managed to get a few scenes in as I rested and tucked into the local food and wine. I find that if you just go by a guide book you can miss out on the real hidden gems of a location. With that in mind, I spotted a church tower on the horizon on the road out from Nîmes. I had no other plans that day and felt it might be a good place to stop and do a quick painting. As I approached the village, I passed a sign which read Aimargues. They tell me that the suffix “argues” suggests that the town of Aimargues has been here since at least Roman times. Almost certainly named after the Roman commander Flavius Armatus. There used to be a castle there too from the time of the crusades, and you can still trace of what looks to be the remains of the wall though this was dismantled in 1616 to prevent the in habitants using it as a strong point during the wars of religion. 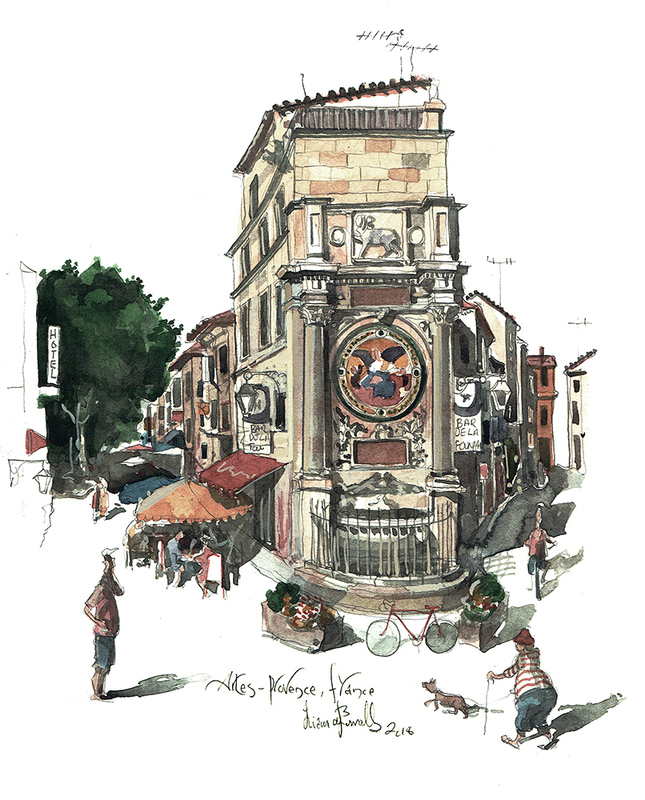 Today, the village makes its living through the excellent local wines and tourists likely to be drifting through. I parked on the outskirts of the village, and threaded my way through a knot of small streets to where I thought the church might be. I finally happened upon the stone built village square with the Neo-Gothic Church of St. Croix occupying one end. On the remaining sides, there was a 19th century town hall with an inexplicably large post office and finally, an ancient covered market which now provides service as an Italian restaurant. The church was fine building though it didn’t really grab me as a painting, so I moved off the square into the maze of medieval streets beyond. A very short walk away, I came across The Grande Brassiere de France. A stone built elegant two story 19th century building complete with carved windows and a wrought iron cover to protect customers from rain and sun alike. A perfect place to paint on a hot sunny afternoon as I had the added bonus that the church could still be seen peering over at the end of the street. I bought a glass of water and sat outside of the Boulangerie opposite and got to work. The painting took about two hours so I had the opportunity to see the locals pop by for their lunch. In typical French style, this cafe was used by everyone. One moment you had a van load of builders, the next, a character who could pass as the local mayor. Once complete, I ventured into the cool and ordered a salad for myself. No one spoke English so I did my best pointing and waving. I’m not totally sure what I got in the end but it was delicious. I told them so too. The owner replied. ‘But of course’. 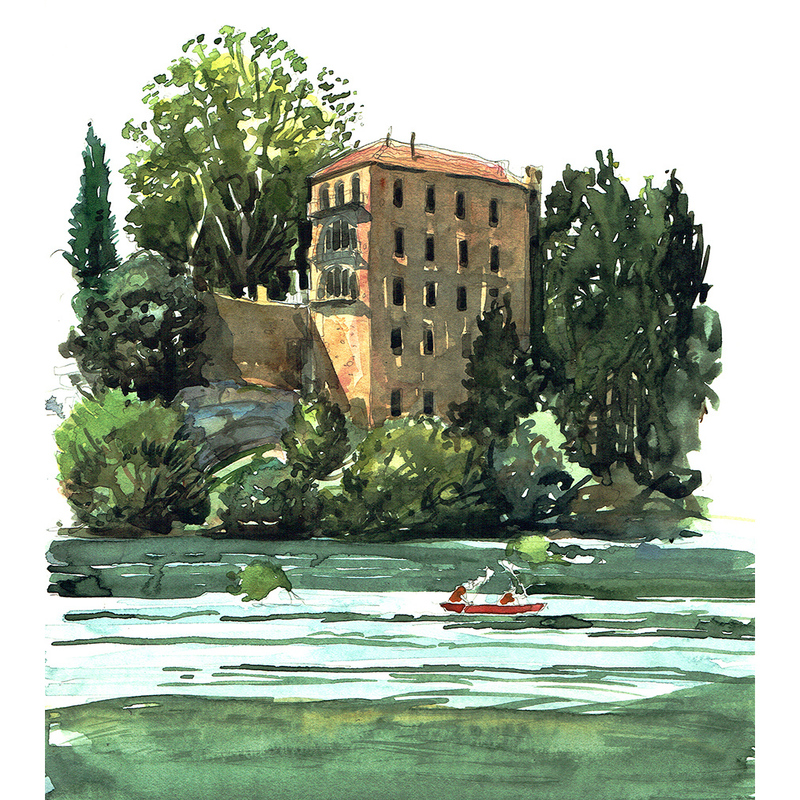 I initially went to Pont Du Gard to paint the aqueduct, however, as this was more of a holiday than a painting trip, I have to confess I indulged enthusiastically on all the local food, and wine so when I lumped down on the banks of the river, I was feeling rather weary. I could say now that I visited the hotel’s restaurant, and sampled the excellent stuffed zuchini flowers. Though I’d be lying. I just got finished my Saucisson, then drove back to the house for a siesta. All that said, according to Trip Advisor, the restaurant is excellent. As I was in the area, I made it a priority to visit the ancient Phoenician, then Gaulish Roman city of Arles in Provence. Arles being the city where Vincent Van Gogh lived for just over a year. Not a very long time at all, though he still managed to complete 200 oil paintings, and over 100 drawings, and watercolours. He also persuaded the mercurial Paul Gauguin to live, and work with him for a few months. A relationship made in hell if ever there was one. Vincent was massively sensitive and Gauguin was haughty and arrogant. Their relationship broke down pretty quickly and Gauguin left after a short time. That said, Van Gogh did some of his most famous works including the Sunflowers. Van Gogh’s little yellow house where the pair lived was destroyed during WW2 and the site is now a non descript roundabout for the local traffic. A great pity. The fountain was built by Pierre-Amédée Pichot between 1884 and 1887. It was built in dedication to the friendship between his father, and the painter Paul Balze. When Pichot first proposed it, the city were initially keen but had nowhere to place it, so Pichot bought the house on the corner between the two main roads into the walled city, and had it built there. The fountain was completed just prior to Van Gogh moving to Arles it is also about a three minute walk from where he lived so he must have known it well. I have looked to see if he ever painted it though I can find no evidence. 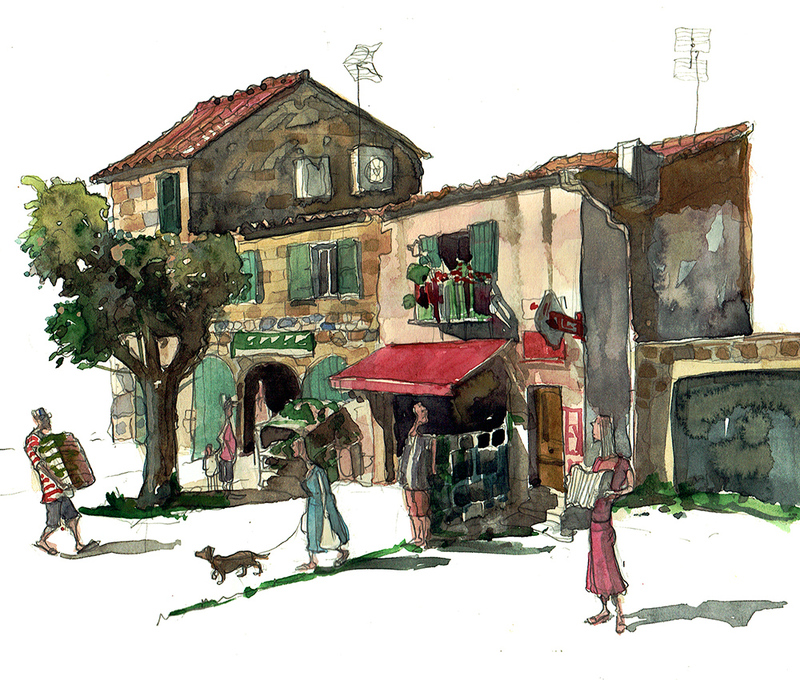 I sat further down the road outside an eatery and painted the scene in the early afternoon. As it is one of the main routes into the city, I got a chance to chat to some of the locals and the afternoon passed quickly, just as well as it was sweltering. Footnote: The back end of the fountain is now a popular Cafe. Only the French would do this. Calvisson is a small town is about 17k outside the modest city of Nîmes and is typical of the ancient and often fortified settlements that sit on the slight rises in the landscape. It must have been a pretty effective system, as there has been a settlement here for over 6,000 years. I painted this scene on market day so the main square was pretty full with stalls selling local produce along with clothing and such like. They appear to make no provision at all for tourists. They don’t even speak English as far as I could tell. And all the better for it. I cleaned the place out of their cured meats, cheese, wine and Saucisson so I could munch and swill as I worked. On the right you can see a wandering accordion player, a total cliché in a Southern French market town. I assure you, I didn’t make it up, she really was there. I thought the sport of ‘Bull Running’ was just Spanish tradition, and was surprised to discover Bull running also happens in Calvisson. Not in Spanish style, but according to the Carmargues tradition where they somehow contrive things so no bulls are injured during the run. That’s rather decent of them. The main object of the five day festival in July seems to be more about horsemanship. There are twelve ‘guardians’ mounted on white Camargues horses which guide the bulls through the streets to their pens. Naturally, the horseless spectators get involved too somewhere along the line, though I have no idea of the rules, and I have to be honest, I’m not sure they do either. The festival is not without some violence, however, as in the evening the farmer boys lope into town, get plastered on local wine, and beat the hell out of each other. Though, as I say, the bulls are left untouched. St Côme is a small village of just 753 souls, and we were living here for our stay in Southern France. We were staying just outside the village and it was a short walk into the centre. On the walk, I would pass the well tended village war memorial. Of course most of the dead were from the first war, there were a few from the second war with one rather chilling edition which read ‘Martyr to the Gestapo’. Despite a tight cluster of houses at its centre, during the day most the village felt near on deserted. Walking about you would see the odd cyclist making a brave attempt on the nearby hills but other than that it was just the odd cat and a temporarily escaped dog. In the evening things got a mite busier. At the centre of town there is a fountain and a small bar and village shop combined. We wandered over to the bar in the evening and were a mild curiosity to the locals. They didn’t bother with us much though, many were glued to the TV as the FIFA World Cup was just about to begin and they were feasting on all the preliminary details. That bar must have been crazy the night France won. And when England lost I suspect. I decided to paint the village from a tree house in the garden of our temporary holiday home. 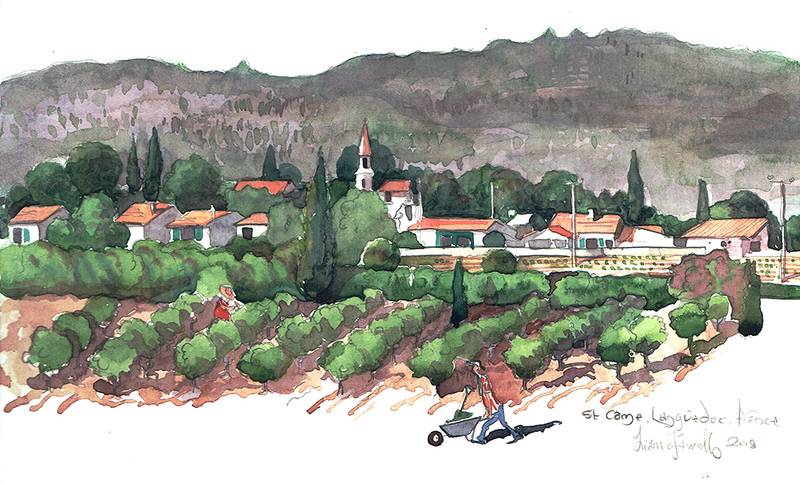 It is a typical Languedoc view across a vineyard with the red tiled roofs beyond. I was looking to capture the timeless pace of Saint Côme. The tower in the centre is capped with a cone with scales tiles resembling a minaret and stands at a height of 27 meters and finishes in 1883 to replace a wrought iron campanile. Beyond are the hills which lead to Nîmes. In the early evening paragliders would hurl themselves off the top and float about for an hour or so. Very restful to watch with a glass of the local red. Love the painting of the old mill.